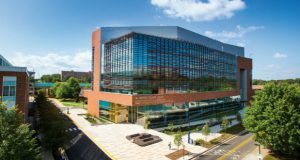 The latest glass building to complete construction on the University of Maryland’s College Park campus, A. James Clark Hall will house the university’s fast-growing bioengineering department, but its impact could stretch beyond campus. The 184,000-square-foot facility, dedicated Friday by campus officials, will also house collaborations with the University of Maryland, Baltimore and its School of Medicine. The total cost of Clark Hall was $168 million. Support for the hall included a $15 million donation from the late A. James Clark and a $6 million donation from biomedical device inventor Robert E. Fischell. Last year, the state legislature formalized the partnership between the university’s Baltimore and College Park campuses, hoping to spur more collaboration and innovation. Last month, the two campuses announced several joint ventures, and Clark Hall looks to further the partnership. Two faculty members for both the Baltimore and College Park campuses will be housed in Clark Hall. Zhongjun Wu, a professor of surgery at the School of Medicine, does basic and applied research of cardiovascular and pulmonary disease and the fundamental technical problems associated with artificial and bio-hybrid organ development. His projects include ventricular assist devices, artificial pumping lungs and computational design and modeling of biomedical devices. Professor Li-Qun Zhang’s work includes developing single and multi-joint robotics for the diagnosis, treatment and evaluation of neurological disorders and musculoskeletal injuries. Students in the bioengineering department working on capstone projects will also have advisers from the University of Maryland, Baltimore. The hope is that the collaboration between the two campuses will improve the learning opportunities and allow for more work between doctors and researchers in Baltimore and engineers in College Park. The Robert E. Fischell Institute for Biomedical Devices will also reside on both campuses. While its primary home will be at Clark Hall, it will also have offices at the UM BioPark in Baltimore. The institute received FDA funding and received some state funds through the legislation that formalized the partnership between the campuses. The institute will focus on the research and development of new technologies to promote health. The building will include FDA-funded Centers of Excellence in regulatory science and pediatric device innovation. It will also have the 6,800-square-foot Leidos Innovation Lab, designed for students to work on cross-disciplinary research and designs. Other features include lab space with movable workbenches, classrooms that can be lecture halls or hold discussion groups, and student club rooms to give space to startups, competition teams and other groups.